Today I am not reading a book but the Sunday Times - it is Sunday after all and there is something about lazing indoors with a newspaper and a cup of coffee when it is raining outside. 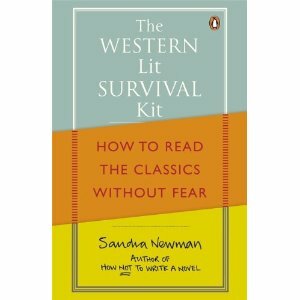 In the "Culture" section I came across a really interesting article about books; an author named Sandra Newman has written a book called "The Western Lit Survival Kit: How to Read the Classics without Fears". What is this, you now ask? Basically, it is guide to all of the greats and goods of Western literature from a women who has read them all. Not only does she give you an idea of storyline and context but she also grades the books out of ten! Yes. Grades. Them. Proust, Austen, Dante. They all get a (fair) trial and are awarded points based on level of humour, importance and accessibility and some of them get a fair bit of criticism thrown in - Kipling, apparently, is irritating. Book bloggers of the world unite and prove them wrong. This sounds like a fascinating book and it will go straight on my TBR. Actually, if wasn't Sunday and it wasn't raining, I'd be heading straight for the book shop now!